The spring rush is here in full force with sunny, nice weather. Things are really jumping on the homestead. We have two turkeys sitting on eggs and three hens have already hatched baby chicks. One had eight, another only two and one more today had four. All are good moms. The hens are Buff Orpington/Cornish cross and the rooster is a Buff Orpington, so the chicks should be nice. Will and Krystal have weeded out tons of grass around the blueberries, laid down mulching fabric, and put six inches of sawdust over that for a dense mulch. 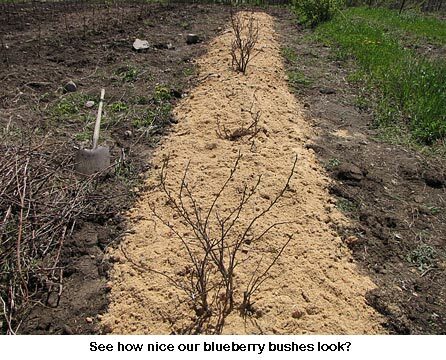 Blueberries like acid and the sawdust will help, although our soil is a little acidic to start with. The bushes are doing well. Our berry patch has been neglected after Will and I fell off the barn roof a couple years back, but now we are trying mightily to re-do it. 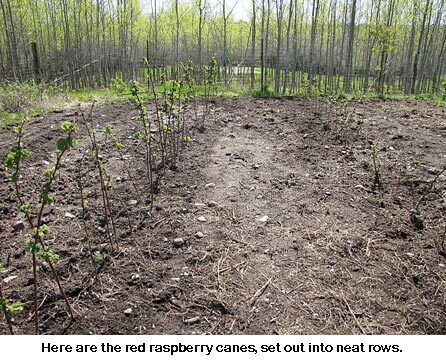 Will and Krystal dug lots of Polana red raspberry canes that had popped up all over the place around the original canes, pulled out the grass roots and replanted them in nice rows that Will had tilled with the tractor tiller. It looks so nice! Now we’ve got to get them mulched heavily with hay, as grass and weeds are a problem in that spot. Krystal and I mulched the asparagus rows in the berry patch with old reed canary grass hay after I shoveled rotted manure down the rows. The asparagus will soon take a jump as the asparagus in the garden was treated the same and already the spears are as thick as my thumb! 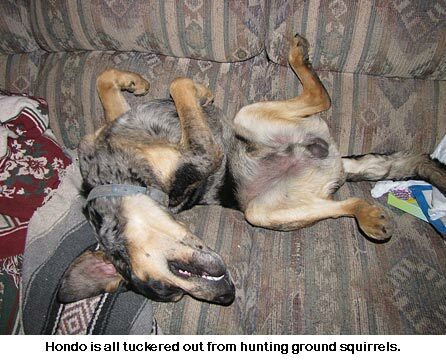 Its too bad Hondo can’t relax! We love our hoop houses! We have doors on each end that we keep open during hot spells and with our cool nights, we have never overheated although a big box fan would handle that in our climate. We plant peppers and melons in ours as those crops don’t do well in the cool nights. For tomatoes, we just plant outside, using Wall’O Waters to start off with. No, no book. But an article is definitely in the works. Stay tuned! Yes, we surely consider Krystal a gem! Hondo on the couch???? Oh no, he’d never do that…. Well, maybe…. Okay, most of the time. I’m intending to put up a bigger hoop house/poly tunnel before summer ends. I do hope you can keep us informed as to how you use yours. How do you handle summer heat? What do you plant inside? General use and purpose info much appreciated! Do you have the Official Polytunnel Book – Ala Jackie and Will for sale yet????? Please…. Krystal sounds like a gem. I’m sure it was hard to find someone to keep up with you folks. Was that Hondo on the couch? Just planting lettuce? I was planting such in March (before an ice storm!) it survived and is NOW bolting! I was in the garden today. Picked peas. Picked a couple green beans. Brussel Sprouts are forming nice. Cabbage will be ready to harvest SOON. Should have had tomatoes and peppers out 6 weeks ago, but with all the RAIN! Then, come September, plant cool weather crops again and EAT off of them ALL winter!